Engel Austria and Italy-based Cantoni have co-developed a new processing method, inject2blow, which combines the injection molding and blow molding processes in one mold on one injection molding machine. Using a 90-ton clamping force Engel victory injection molding machine and a 2+2 cavity mold produced by Cantoni, production of wide-necked jars can be as fast as 14s. Engel said the method is first of its kind in the market and it allows small ready-to-use containers to be manufactured in one process. In addition to the Engel injection molding machine, the integrated production system includes a Cantoni sliding table mold and an Engel viper linear robot which removes finished parts from the mold. Both the injection molding and blow molding processes are visualized, monitored, and controlled via the existing Engel injection molding machine CC 200 control unit. inject2blow is applicable in both victory and e-victory series of Engel. These machines have plenty of free space for the sliding table mold because their clamping unit does not have a tie bar. As the mold clamping platens of tie bar-less machines can be used up to their edges or even beyond, large molds can fit on comparatively small injection molding machines. Machine size can therefore now be decided according to the required clamping force instead of the size and movement radius of the mold, which helps to lower investment and operating costs. The barrier-free mold area also simplifies the automation process, because the robot can access the mold from the side without being hindered. Unlike traditional two stage methods, preforms do not have to be heated up again before the blow molding part of the process. According to Engel, the new process achieves significant energy saving when combining with Engel’s ecodrive option for hydraulic machines. The inject2blow method can be used to process a wide range of thermoplastics from PE, PP and polycarbonates to PET. Cavity inserts make it easier to change from one product to another, and the production of small batches economical. 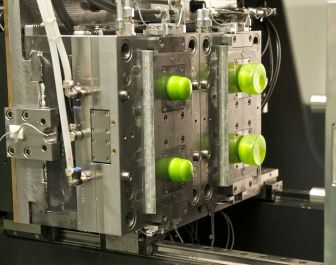 It can still be used to manufacture classic injection molding products, Engel adds.